Two radio shows on Monday were quite lively. 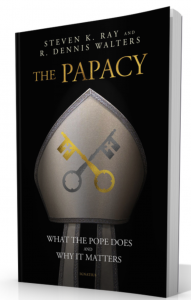 They were both based on my new book The Papacy: What the Pope Does and Why It Matters. The first was an interview with Fr. Robert McTeigue SJ. What a sharp and perceptive priest. He asked me very pointed questions about Pope Francis, today’s Vatican and the papacy in general. It was well worth the hour. I spoke more openly about these matters than in the past. Hope you enjoy the show. 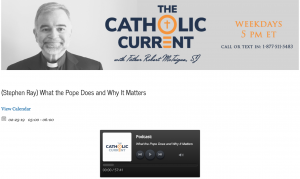 The 2nd was on Catholic Answers Live but I will post that show later today. Click on the image below to go to the podcast or click HERE. What is Epiphany anyway? And why should I care? The Feast of the Epiphany – the Magi, the Baptism of Jesus and the Miracle of Cana all combined – is really quite fascinating. It was actually a celebration in the Church long before Christmas was celebrated and eventually overshadowed Epiphany. John Paul II gave 52 Homilies that mention the word Epiphany, or are centered on the Epiphany. The word epiphany means a sudden insight, a revelation. In Christian terms it refers to the manifestation of Jesus’ divinity to the world. The Baptism of Our Lord was such an epiphany as the voice of God revealed the true nature of his Son. In Cana the disciples saw his glory and believed, and the Wise Men understood who he was so that even the Gentiles saw the glory of God. 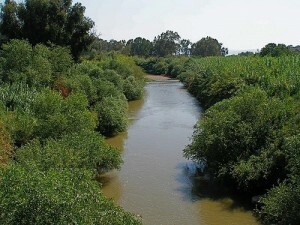 Today is January 6, the Feast of Epiphany and WE ARE AT THE SITE OF JESUS’ BAPTISM (see video later today) – which was more important in the early Church for the Epiphany than the Magi’s arrival. For Steve‘s article “Did the Wise Men Meet the Shepherds” click here. To read about the Epiphany in the Catholic Encyclopedia, click here. For brochures of upcoming pilgrimages and cruises, click here. For more info, call Suzanne at 800-727-1999, extension 121.